My friend Frank Wilder however (who spent several years in Paris) referred me to an iconic pub (?) near our apartment called Académie de la Bière (Beer Academy). Indeed it is only 3 blocks away and we visited today. Hope this post brings back tasty memories Frank! 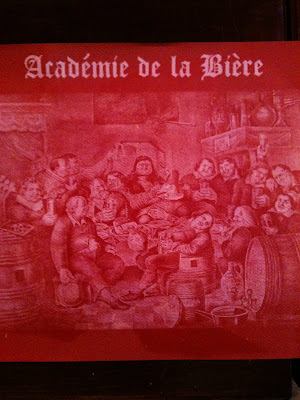 Twelve beers on tap and about 150 different bottled beers do indeed make for a prestigious Beer Academy. 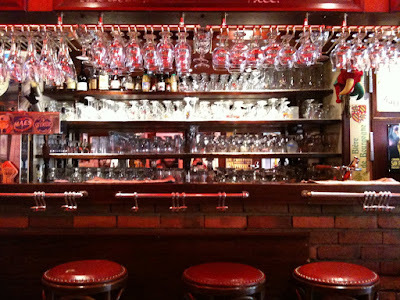 This Latin quarter pub has been an institution since 1960 and still serves a jovial crowd of students and beer aficionados. For a complete Belgian experience, order some moules-frites (steamed mussels and fries) and taste the night away. For other reviews and a picture of the outside (I have one also, but it's not so good), click here. Well, given that school is still out and the rest of Paris are on vacation, we were the only diners at lunch today (well, there was this blond chick who kept leaving the bar to smoke -- smoking is not allowed indoors in public establishments in France! -- but she doesn't count). Here's a couple of pictures inside. The place is not very large; the outdoor seating is much larger than indoors. In any case, I had committed before I came that I would drink as many beers at the Beer Academy as I could and record each one here for posterity. 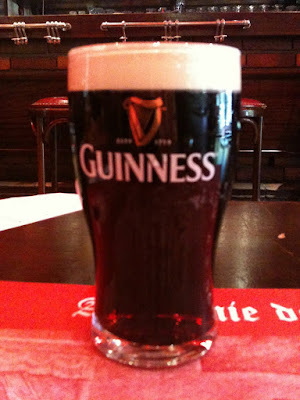 So today, in addition, to the 4 sausages and fries we shared, I had a Guinness Dark (25cl -- about 8 oz or 1/2 pint) which probably is like trying single-malt scotch for your first liquor drink or Shiraz for your first wine -- it's a little on the strong side. Actually strong isn't the right word because I couldn't taste any alcohol; it was bitter although the creamy foam on top was kind of cool, kind of like what they put on top of hot chocolate in the winter although not as sweet. Also, compared to the Blue Moon I had 2 years ago, it wasn't nearly as "fizzy." The Blue Moon bloated me in no time, whereas I thought I could sip Guinness all night -- if I liked it that is. It's not that it was bad; it just will take some getting used to. Guinness was an ironic choice because the Academy of Beer is known for its Belgian selection and Guinness is of course Irish. However, it was the only name I recognized so I started with that. My wife had some blond something or other that I couldn't pronounce (and can't remember). I will keep you updated. With over 70 days to go, who knows how many different beers I will have.